I didn't really mean to take a Blogging Break. But seems like the real world just crowded the computer out for a couple of days. I guess it was just a little mini-break. We celebrated our anniversary on Thursday--Not a big to-do, just a sweet day. Lee and I had a steak dinner and later Greg and his family came over for a while. They brought fudge pie! Yum! Kevin called to wish us a happy, happy--They will be visiting in a few days. Lee sent me a bouquet of daisies--one of the flowers we used in our wedding--and some wonderful chocolate goodies. His gift from me was my anniversary post. We had an agreement of no gifts because we had just made some purchases of things we both wanted. He cheated! Thank you to all the blogging friends who came by Cherish. 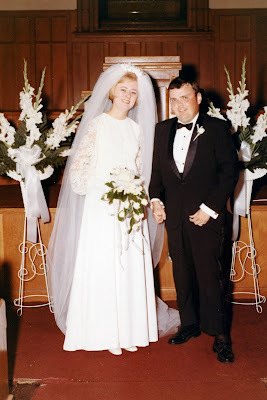 . . and read/commented about our wedding and anniversary. We also had several emails from friends and family who read Cherish. . . the word! but do not comment. Friday was one of those strange days. You know, the kind of day when you start the day with a definite to-do list, or at least a plan? At the end of the day you realize you were busy, busy--but you didn't necessarily complete anything that was on your list. It was all good, but I just didn't have time for the computer. I didn't even put up a Show and Tell post. That's one of my favorite blogging activities, so you know I was busy! I will get around to see most of the treasures from everyone else--I promise! I love blogging, but the grands win over the computer every time! Luke and Ella were with us for part of the day yesterday. Then, in the afternoon, one of Lee's childhood friends came for a visit. Lee was about ten and his friend, Gary, was younger when they played together! They have seen each other a few times as adults, but it has been more than twenty years since they spent time together! The connection that Lee and Gary had in childhood is sort of unique. Gary's grandparents lived near Lee's family in Virginia. Gary grew up in Tennessee, but visited his grandparents every summer. The boys had a summer friendship spent playing back and forth across the street. 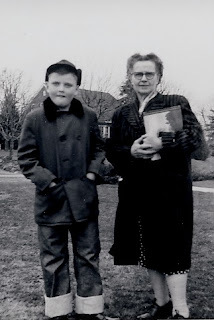 Gary's grandmother, Rose Smith, was Lee's teacher while he was educated at home the first four years of school. He actually went through six grades in those four years--that's another story for another time! I wish I had a picture of Lee and Gary from those days, but in all the thousands of pictures we have I don't believe there is one. 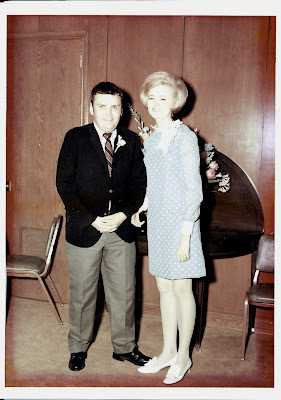 However, we do have a photo of Lee and Mrs. Smith from that era. Lee has fond memories of learning with Mrs. Smith as his teacher. Her daughter, Peggy, was Lee's next teacher. Actually, Gary had a copy of this same picture with him when he came to visit! Check our Lee's fashion statement! He claims that he thought he was cool with those jeans rolled up. Look at the hat! I really don't think he would have been picked for a Gap ad! Still--Isn't he a cutey! After the anniversary day and the visiting day I have returned to the blogging world. I found out some of you sweet people have been really busy! I will post again soon--maybe even later today--to comment on some of the goings on I discovered when I returned. I also have a lot of visiting and reading to do. See ya soon! We were twenty-three years old. Well, Lee was soon to turn 24. He was a seminary student. He finished his degree two weeks later. I was an elementary school teacher. We were married at the church where we met--in Watson Chapel of University Baptist in Fort Worth. We didn't actually meet at the church, but we were with church friends when we met. We planned and paid for most of the wedding celebration ourselves so it was not an extravagant affair, but it was nice and just right for us. Our families were there along with a few of my college and high school friends, and mutual friends from our church and the seminary. I told more about the ceremony, our unique first meeting and our wedding in a post here. This is my Daddy, Charlie. I always called him Daddy. I was the youngest of his four children. He had a step-daughter five years younger than me. I was the third daughter he walked down the aisle. My mother died when I was in the first grade. 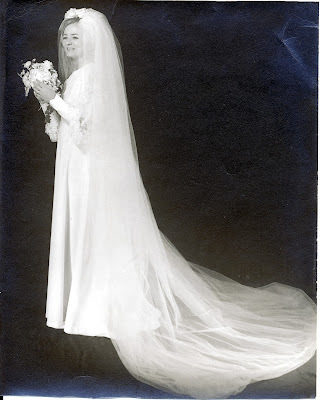 She was not with us for any of our weddings, but I know she would love the family that was founded on that day. Daddy died twenty years later, after a long and difficult Alzheimer's journey. Lee and his mother smiled for the camera in the pastor's study before the ceremony. Emma is a sweet and dedicated Christian woman. She is 92 years old now and still has her own home. She lives near Lee's brother and his family in North Carolina. When we married, she lived in Florida. I think she thought she was coming to the end of the world when she came to Texas for the wedding! Lee's father had passed away less than a year before we married. I am so thankful that I met him the summer of 1968, just a few weeks before he went home to heaven. I visited Lee's family in Florida and met his parents then. His Dad was a great tease--He called me Tex. So here we are after the festivities of the evening, ready to leave the church and start our life together. Do you remember how girls always had a "going away dress." and wore a corsage from the bridal bouquet? Look! He has hair and I'm down right skinny! Those were the days! We were not sure what God had planned for us, but we knew we would do it together. We really were clueless. Which was probably a good thing! If we had known all the twists and turns in our future we would really have been overwhelmed--with the challenges and the unbelievable blessings that were to come our way. We really have had a very blessed life. I don't mean it has always been easy and we have had no problems. We have had peaks and valleys--some very high peaks, and some extremely low valleys--just like most people. However, God has always guided us through the hardships and celebrated the joys with us. The two greatest blessings we have had are our sons, Greg and Kevin. The greatest sorrow was the loss of our infant daughter, Dawn Marie. We feel that God led our sons to the wives He chose for them. Audre' (Greg) and Holly (Kevin) are wonderful Godly women. We are so thankful they are in our family. Of course the grandchildren are absolutely the "icing on the cake." Joshua and Isaiah are Kevin's children; Luke and Ella are Greg's. Our family is our most significant blessing, achievement, and reward in life. We, with the guidance and blessing of God, founded this family in that chapel in Texas thirty-eight years ago today. We may have been somewhat naive and clueless, but God was not. Others may have been skeptical, but God was not. We have definitely made mistakes along the way, but God has not. He always knows what He is doing. Thank you, Lord, for June 28, 1969 and all the days since. I have been trying for some time to scan some old photos. You may have read about that here. I had scanner woes! I have woes no more! In that older post I said we would have a photo fest at Cherish . . . when I solved the problem. Well, get set! Tomorrow the fest begins! I didn't solve the problem by myself. My husband--bless his sweet heart--took pity on my misery and said, "Let's just get a new one!" You gotta love a man like that! I really think he had a good idea! The solution is much better than the two older models that were not cooperative with me. Here's the solution machine! All practice scans have been successful! Ya'll come back tomorrow! We'll be having a little mini photo fest celebrating a very important date in the House of S. It will feature a young, happy, and pretty much clueless couple! In traveling around the blogoshpere I have noticed several giveaways. I thought I would remind you of some of those. I'm sure there are more. these are the ones I have seen most recently. Don't forget to sign up! Mrs. U at Making a House a Home is celebrating the First Anniversary of her blog Lots of goodies for the dedicated, or would-be dedicated homemaker. Overwhelmed With Joy has a book giveaway going on--The Memory Keeper's Daughter by Kim Edwards. I have read this book. You will be swept into a story full of family secrets and the consequences of life-changing decisions. You will stay engaged to the very end. Go on over and get in on the fun. We probably shouldn't mention Barb's wedding favor giveaway. It's almost time for it to be over and she has about three million people signed up for thirty wedding favors from that beautiful wedding she planned with and for her daughter! Well, go on over if you really want to risk the odds. You know the way! I'm sure there are other contests out there. Let me know if you see another good one! See ya tomorrow when that young couple will be here! Just to explain--I tried in a link in my Woman to Woman post to give you opportunity to hear Travis Cottrell sing this beautiful hymn. I have found that the link is not working as I intended. I can't find a legal way to offer Travis. So here is another friend, Fernando Ortega, singing Be Thou My Vision. I hope you enjoy. "Share an important quote and what it means to you." Morning Glory at Seeds in My Garden says, "That should be a fairly easy topic for just about anyone, so if you've been lurking through our Woman to Woman weeks and haven't participated, this is a good time to jump in on it." Morning Glory is enjoying a little blogging break while vacationing this week. Therefore, all Woman to Woman posts can be linked with Lei at My Many Colored Days. You know you have a favorite quote. Tell us about it and go see Lei to add your site to the Mr. Linky. This is an old Irish hymn that I don't remember hearing before 2002. The text is attributed to Dallan Forgaill in the 8th century. It was translated into English by Mary Byrne in 1905 and organized into verses by Eleanor Hull in 1912. There are other variations, but this one is probably most common. The hymn has, in recent years, gained some popularity and is being sung and recorded by modern Christian singers. So how did this rather archaic sounding hymn become important to me? My husband was on a work trip to Greece and Turkey in the spring of 2002. I was privileged to get to travel with him as he produced Beth Moore's Bible study, The Beloved Disciple. Travis Cottrell was a part of that production and taught all of us included in the tour this song. It was used as a music video in the completed study. It was a great joy to watch that video being produced in the city of Ephesus. I sat near the ruins of the old library, totally fascinated as I watched the crew and Travis work on capturing the essence of the study in this old song. Even today, when I look at pictures of that trip, the sight of that ancient library and a nearby weather worn pillar on which Travis stood, can transport me back to the joy and awe I felt as I watched and listened on that beautiful day. Another flashback to that day involves a portion of the video taped in the amphitheater in Ephesus where Paul preached. There were about 600 people on the tour and in the study group Beth led in Athens. At this point all of those people were sitting in the seats of this amphitheater and Travis led them in this song. Well, he led some of them in this song. Even though we had sung it in the Bible study in the days before we had not all learned it--because of the language, it is not easy to learn! So--if you ever see that video you can just know some people are cheating--they are just moving their mouths :-). But just imagine, sitting in the ancient amphitheater in Ephesus, singing with Travis Cottrell under a bright blue sky! I was not sitting in the middle of the crowd. I was over to the side taking it all in. (I always try to stay off camera!) It was a little piece of heaven on earth! Oh My Goodness! Computer Problems! Oh! Don't you love technology! We have had some major problems with computers the last two days. We were having some problems on Saturday and then yesterday there was a storm! (I am thankful for the rain, but please don't mess with my computer!) Between the storm and some equipment malfunctions we have been completely without for over 24 hours! Oh My Goodness! Lee and I have both been in withdrawal! I think we have solved the problem--at least temporarily. Our son helped yesterday and between him, the Com*cast guy, and me we found what we think is the problem. We have ordered a cable I think needs to be replaced. However, we were still without Internet! I just couldn't stand it any longer! So this morning I went back into our office, which is equipment central, and messed around a little more. Now I have a patch-up job going on--but at least we are back on line. I hope it works until we get the cable. Lee and I can once again sit in the same room and forward emails to each other! Yea! Now see, blogging is a good thing. I would not be nearly so motivated if I wasn't anxious to get back on line and check out the wedding of the year and other super important things going on in Bloggyland! I will be back in a little while to check up on some people and do a real post! First, I really do have to take care of some things irl. See ya later! Welcome to Show and Tell Friday!" Do you have a something special to share with us? It could be a trinket from grade school, a piece of jewelry, an antique find. Your show and tell can be old or new. Use your imagination and dig through those old boxes in your closet if you have to! Feel free to share pictures and if there's a story behind your special something, that's even better! If you want to participate, click over to Kelli's and join in the fun. I was scrambling in my brain for a Show and Tell goody this week. There's been a lot going on in my real world so I had not prepared a Show and Tell post. Some friends came to visit today and brought my husband and me a real treat. Let's see…It's not a trinket, not a piece of jewelery, nor is it an antique. It is new--but a little bit old, too. This is a copy of A Woman's Heart: God's Dwelling Place. It is the new Bible study with Beth Moore. It is an updated edition of the first Beth Moore Bible Study that was published--way back in 1995. It is an in-depth study of the tabernacle and how God seeks to develop a relationship with his followers. Those of you who have participated in a Beth Moore Bible study know how her profound Biblical knowledge, superb teaching skills, and indescribable humor can lead you through a unique and unforgettable learning experience. What makes this even more of a treasure is that for months I have been wrestling with the idea of leading a Bible study in my home one day a week. I have considered doing this several times in the past and have always, for one reason or another, decided the time was not right. I have been struggling with the decision again. I had also been considering whether to use one of Beth's studies, and, if so, which one. When our friends came in with that beautiful box today I felt like I had my answer. It's possible that I will soon be sitting here with my Bible, a study guide, and a DVD as I study, pray, cry, and laugh with Beth and some friends as we consider how the Old Testament account of the building of the tabernacle can impact our lives today. Now, THAT should be a real experience to treasure! Thank you so much for the kind comments and especially for your prayers. Lee is doing well this morning. Our trip to the hospital was, as always, interesting. In fact, I tried to write about it last night and realized I was whining. I decided to wait until I was not so tired and was in a more positive mood! The procedure Lee had yesterday was relatively minor and went off without a hitch. It only took about 30 minutes of actual time with the doctor. However, we left home at 8:30 and did not return until 3:00. And therein lies the tale. Since I have promised myself I will not whine I will not tell the whole tiring story. I will just say that if you have ever wondered where the high cost of health care comes from, I had a peek at time and money being wasted yesterday! It wasn't in the operating area. The admissions procedure took almost an hour!--At a hospital that already has a large piece of computer space taken up with information about my husband. You would think a couple of clicks would take care of it! My! My! My! The important thing is that Lee is doing great, we are home, and God is good! Now we are looking forward to the return of E Girl and L Boy (and their parents, too) from Louisiana. They plan to be here sometime today and will be staying with us a day or two while they get a few things taken care of at their new address. We are looking forward to seeing them! Lee and I will be going on one of our medical adventures tomorrow. This is a trip we have made before and do not particularly look forward to. Because he is on a ventilator for assisted breathing, Lee also has a feeding tube in his stomach. Strangely enough, he doesn't use the tube much for nutrition at this time. He eats--just like you and me. There was a time when he used it for almost all nutrition, but now he only has medication and occasional nutrition through it. He is currently able to satisfy nutritional needs through eating and supplemental vitamins, etc. Occasionally the tube has to be replaced. It is time--The tube is, for lack of a better way to explain it, out of place. BTW--I use very practical terms to describe Lee's medical situations--you will hear very little medical jargon from me. After all, I am not a medical doctor. Trust me, we have been doing this long enough that Lee and I know when something is wrong! The tube is definitely wrong right now! • Wait for her to consult with their doctor and call us back with the correct protocol--This was necessary because we were not using Hospice the last time we had this procedure. We have to call them first for all concerns. • FINALLY, a call back from that nurse to confirm our appointment at the hospital tomorrow. Actually, that was pretty simple compared to some things we have gone through! Everyone moved pretty quickly on their part of the process and we were fortunate to get an appointment early in the morning. We should be home by noon. This is not a difficult procedure. It will be done by a radiologist, a specialist who basically inserts tubes, etc. They use an imaging machine to know where it needs to go. It does not take long and Lee does not have to be completely anesthetized. As soon as he is back in the room and meets alertness requirements we can go home. It usually takes less than two hours when we have an early appointment. We haven't been to Same Day Surgery for about five months, so it should be kind of like old home week. All of the nurses know us because we have been there several times in the last two years. They have always done a good job of caring for Lee. They treat him like a favorite patient. I'm sure they treat everyone that way! Lee will be OK. They will fix the problem and send us on our way. I will be OK. Greg usually makes these journeys with us. He is still in Louisiana. I will miss having our cup of coffee together while we wait. He and Kevin will be expecting me to call as soon as the procedure is finished. They keep close tabs on their Dad's progress. So, I know that more than likely I'll be back here tomorrow night, posting something else--maybe the Dream Meme Betty tagged me for last week. But, for tonight, I just pray for God's mercy for Lee tomorrow as he goes through yet another medical procedure in this long health/faith journey. 6Do not be anxious about anything,but in everything, by prayer and petition,with thanksgiving, present your requests to God.7And the peace of God,which transcends all understanding,will guard your hearts and your minds in Christ Jesus. 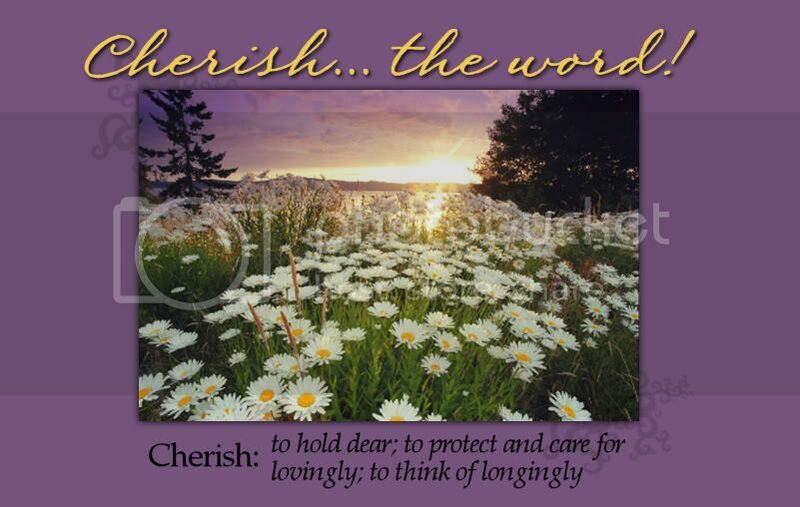 New look for Cherish. . .the word! WELL! I was just thinking I would write a quick note to tell you about the change that was going to soon take place. Then, lo and behold, Susie made the switcheroo! Welcome to my new digs! Susie at Bluebird Blogs is responsible for the updated look. I am delighted with it! Susie is incredibly talented! She takes a picture, a few simple directions/ideas-- and voila!--an incredible new look! She gave me just what I wanted--and some things I didn't even know to want. If you want to join the fun, run over to Kelli's and check in. I was planning on sharing something different this week, but with all that has gone on in our family this week, I started thinking about grandmothers. If you have read my blog for the last few days you know that two of my grandchildren lost their other grandmother to a battle with cancer. My last post was about Rita. I started thinking about the responsibility of being a grandmother and that led me to remember my own grandmother. I only had one; my mother's mother had died years before I was born. 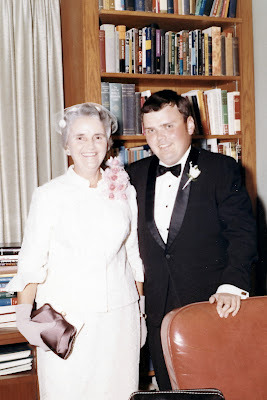 Most of the memories I have of my Dad's mother are after she developed what we would now call Alzheimer's. Back then they called the disease "hardening of the arteries." She was forgetful, distractable, and often did not recognize family members. She died, at age 86, when I was thirteen years old. I may not remember Grandmother the way the older cousins, my older siblings, and my Dad's generation remember her, but I do know some things about her. A lot of what I know came from stories I have been told all my life; some from my own memories. When I was very young the family gathered at her small home for Christmas and other holidays. We loved being there. When I lived with my Aunt Frankie, Grandmother spent almost every night with us. She would go back to her home during the day. Sometimes when Aunt Frankie had to be gone for short times she would leave my sister and me with Grandmother. I wonder who was keeping who on those afternoon visits! Grandmother raised eleven children who all became fine, responsible, Christian people. Those children were proud of their heritage and told loving stories of "Mama." She was the wife of a Baptist preacher. They helped to start several churches in West Texas and were well loved. I think that every time I was at Grandmother's house someone was drinking coffee. There must have always been a pot going. I know my Dad and uncles consumed gallons of it. That's one of the reasons my show and tell item means so much to me. Look carefully at this picture above. You will be able to pick out which items I want to share with you. Right there on the first shelf--dark green--little--with a handle. That's right. the little Fiesta mugs! The summer after I graduated from college I was visiting Aunt Frankie for a few days. I was getting ready to move into my first apartment. Aunt Frankie said she had some things in storage that I might be able to use. Among some assorted cooking utensils and some mismatched mixing bowls, etc. there were these four little mugs. Aunt Frankie said all of these things had belonged to Grandmother. I was glad to have the mugs and a few other items since I didn't have any dishes yet. I didn't realize until years later that they were Fiesta--or even know that Fiesta is very collectible. In the picture above you can get a closer look at the mugs. in this picture has another connection to Grandmother. This tray stands on the counter in my kitchen as a visible reminder of my family. Fast forward almost forty years later. Several years ago I got interested in modern Fiesta dishes. I commented to my husband that I would like to have some. I mentioned that I eventually might like to have four colors, but would just like to start with a service for four in one color. My sweet husband, never one to do things half way, used that off-hand comment for my Christmas present. with the mugs I received in the next century. They had to drink a lot of cups of coffee to get enough! I hope that some day a grandchild might like to have my dishes. Whether I give them to them, or they are passed to them by someone in the generation between us, I hope they will enjoy having something that belonged to me. Maybe they will tell stories about Grandmama to their little ones. Maybe they will write stories in whatever their version of a blog is. telling how they came to have the yellow, green, red, and blue mugs. Whatever they do, I hope they will remember fondly the time they spent at Grandmama's house and know that I loved them very much. Oh yes, before I go--Did you figure out why that tray is a family reminder to me. Give up? OK--I'll tell you. Grandmother's last name is on that tray standing behind the mugs. Our friend, Rita, passed away yesterday. She was the mother of Audre', our daughter-in-law. We have shared children and grandchildren with her for many years. Audre' has been a part of our hearts and family for fifteen years, when she and our son, Greg, met. They married twelve years ago. I told some of their story here. Rita loved life. She had many friends. One of her joys in life was giving gifts to the people she knew and loved. We have been on the receiving end of her gifts many times. When she came to Tennessee she usually had a little something to share--It might be a special bookmark, a delicacy from her beloved Louisiana, or, of course, pictures of our shared grandchildren. The two grandchildren we share, Luke and Ella, love their Ri-Ri exuberantly. After a visit they always had stories of the fun they had with her. Her gift-giving habit was, naturally, enhanced with them. When she came for birthdays she always brought a truckload, literally, of toys, games and clothes! She never missed a birthday for either one of them until this spring. I guess we all knew the approaching inevitability of her disease when she was not able to travel in April for E's birthday. Rita also had a love of animals and she must have wanted her grandchildren to share that love. When they went to her house they spent time with cats, dogs, and horses. One time she even "borrowed" a friend's pig so that L could experience life with a pig up close! He has a horse at Ri-Ri's. We always enjoyed hearing his stories about riding Ginger. We have many pictures of Luke and Ella riding Ginger, being led by Ludlow (Rita's husband whom she married just a few years ago), Trigger joined Ginger a couple of years ago. Rita needed a horse so she could ride with L! Last year, when she learned her diagnosis of pancreatic cancer, she planned a trip for her family. Audre, Greg and the kids met her and the rest of the family, which includes Audre's brother and sister, for a week at the beach. They had a wonderful time. This year they went again for Memorial Day weekend. Rita was celebrating her extra year of life. Some doctors had not, in the beginning, been optimistic about a prognosis that included a year. Rita's family jammed a lot of living into that year. They shared birthdays, holidays, and her son's wedding last fall. Rita had aggressive treatment with a doctor that she traveled to Texas to see. She improved and surprised people with her strong insistence to not give in to the disease. However, with each passing event, it became more and more clear that, even though Rita and her doctor had fought a good fight, the disease was progressing. Greg and Audre' made the trip last week that they had been dreading. It appeared that Rita was slipping from them. Yesterday, with her three children, her husband, and other family members with her, Rita left this life. Audre' is the spiritual strength in her family. As I spoke with her on the phone yesterday I wanted to put my arms around her. She knows I love her. She knows that Lee and I count her as one of our children. She can talk about anything with us--or not talk--whatever she needs. If my husband's health condition allowed I would be with her. But, right now, all I can do is be here for Greg as he hurries to get their house moving arranged and travels back to Louisiana. Greg returned home on Tuesday to keep the scheduled appointments for closing on the sale of their house and purchase of the new one. He has arranged for storage of everything they are moving, and the cleaning of the old house for the new owner. He is moving some things to our house and garage. They will complete the move when they return home. I'm sure they will stay with us for a few days while they get everything sorted out and moved in. Greg will be back in LA by Friday. The funeral is scheduled for Saturday. We will miss Rita. We will miss her directness and her outspoken way of declaring her opinion. We will miss her generosity. We will still hear stories about the grandchildren's trips to Louisiana, but those have always been first and foremost trips to see Ri-Ri--So we will miss the exciting stories with Ri-Ri at the center, along with Ludlow, Ginger, Trigger, and the assorted dogs, cats, and occasional pigs. We will miss her visits for birthdays, Halloween, and other child-oriented events. We will miss sharing the grandchildren and children. We promise we will love them well. we are away from the Lord. and at home with the Lord. This topic will be particularly relevant to today's young mothers. There is such a variety of baby products available in stores that it can be overwhelming. Add to that the pressure you often feel from your peers to have the latest and greatest of baby equipment. Add to that still the bombardment of products that promise to make your baby smarter, faster. When you want to be hip AND have those things that make mommying a little easier, how do you keep from breaking the budget? For those women who are past the child-raising stage, do you have difficulty with these pressures in wanting to provide the "goodies" for the grandchildren? 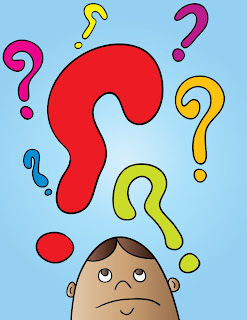 Do you see them as a hindrance towards a child's natural ability to develop? What were some ways that you were able to achieve similar benefits without all the bells and whistles?" "Having the latest baby everything..."
I have thought and thought about this topic. I have tried to remember what it was like to want "the latest baby everything" when my children were born and I have tried to relate to it as a grandmother. As I was about to come to the conclusion that I really don't have much to contribute, I happened to recall a family story. This little story pretty much sums up how I have come to view the idea of needing the latest or most popular of anything. Granted, the story does not speak to such things as baby equipment, but it is an example of working with what you have, even without all the bells and whistles. My grandson, S Guy, who was five at the time, provided a real-life illustration of the concept of stepping out of the race for the latest brand name whatchamacallit-especially for children. S Guy is a very creative and innovative child. He loves to draw and make things. While he was at our home for Thanksgiving we had a piece of furniture delivered. It came in a box. S immediately asked the delivery men if he could have the box. No child has ever been prouder of any toy than he was of that box. He entertained himself for the remainder of the weekend! That box became a magnificent pirate ship. S got his dad, Kevin, to make him some swords out of cardboard. A piece of packing material became a pirate hat. He asked for something to use to "tie the boat to the dock." He and I went searching for something he could use for that. We agreed on one of Poppy's ties. Poppy was glad to donate one to the cause--He doesn't wear ties anymore and never did particularly like them! When his family got ready to leave s wanted to take his ship with him. There were TEARS when his parents told him it had to stay at Grandmama's house. I suggested that his other grandmother, who lives next door to him, might have some cardboard. He tearfully assured me, "Nanny never has cardboard!" Now, I know Nanny! First of all, girlfriend can SHOP--Something has to come in a box! More importantly, she would move heaven and earth to get cardboard for that little boy if he asked for it. But at that moment, he thought he would never see a cardboard box again. He was not a happy child as he left with this parents. I assured him the box would stay in the garage. It is still there, ready to become anything he wants it to be. Is it necessary to have all the latest and greatest? Of course not. Is it OK to have it? I think it is, if it is reasonable to do so. Do most people have it all? I doubt it. I imagine most of us have quite often used the cardboard box philosophy--make do with what you have. After all, the old cardboard box can be anything you want it to be! Here's Pirate S Guy to prove it! Note the "rope" that secures the ship to the "dock." * Many who read this blog are aware of my husband's continuing physical/health problems. I wrote about it here. He has good days and days that could be better. Recently he has struggled with heavy lung congestion, fatigue, and pain. Lee, being Lee, doesn't complain and continues to work on writing projects when he can. However, the last week has been particularly difficult for him. • Greg and Audre' left yesterday to go to Louisiana to be with her mother. Rita has battled pancreatic cancer for over a year. She is very ill now. She was in the hospital last week, but has come home now with hospice care. Greg and Audre' are supposed to close on a new (to them) house this week and move next weekend. Those plans are moving ahead, but they are really having to juggle a lot of responsibilities during this very stressful time. The current plan is for Greg to travel back home to take care of the house closing and move. As a matter of fact, he just called and is already on his way back after taking time to sleep. They already had almost everything packed and ready to go, so that should help during the actual move. Audre' has done a remarkable job organizing them to get their house ready to sell and prepare for the move. Greg will follow through on the plans and get them from one house to the other. • My nephew's daughter is going through cancer treatments for the second time in two years. During that time she had surgeries , chemo, and radiation treatments. Her extremely rare form of cancer had been in remission for months until April. She has now started chemo treatments in Houston, where they live. Carolyn is not quite twelve years old. She is going on with her life; playing softball, swimming, and being her exuberant, cheerful self. She is an inspiration to the adults around her who wait, prayerfully and hopefully, for remission to return. * My brother continues to recover from heart and lung surgeries he has had during the last year. He has had a remarkable journey through cancer and heart disease with steady improvement. • Lee's mother is at home continuing to recover and rehabilitate from hip surgery. She is 92 years old and still insists on living in her own home. Lee's brother lives nearby and spends much of his time taking care of her needs. We are grateful he is there. • AND--We have the usual aches, pains, complaints, and troubles that we all have all the time--You know the ones that just accompany life and seem so important until you have these other things happen! I don't mean for this post to be depressing, or to unload our difficulties on anyone else. I just want you to know why that Psalm touches my heart so much at this time. 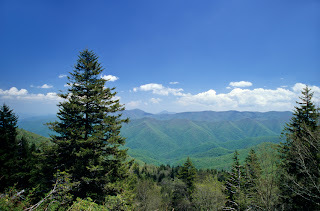 The Psalm directs us to look above and beyond the hills. We are to look to God who has given us not only the hills, but the earth, and everything in it. He is watching and caring for us. He has no need for sleep nor slumber as we do. He is watchful at all times. While God has given us the sun, he also provides shade from the sun, and the moon to replace the sun at night. He watches every step we take. Yes, He knows our lives and our needs. He has an answer for all the hurts, missteps, and anguish in our lives. We just have to wait for and accept His answers in His time. But look at that last verse. Wow! This verse sums it up. It tells us that the Lord watches over our whole lives. He is with us when we come into the world and remains with us as we live the life He plans for us. He is also with us in our goings--as we move through our older years and into our "forevermore." He cares for us now in life and forever into eternity. What a promise to claim.! It is time for Friday Show and Tell. This is one of my favorite blogging activities. If you want to participate hop over to Kelli's and read all about it. Sign up and show us something you treasure. My husband and I were privileged in the spring of 2000 to take a trip to Israel. For him it was a work trip: for me, mainly vacation. I did help by serving as a bus hostess for the tour part of our trip. It was a remarkable trip and experience. We visited the Galilee region, Bethlehem, the Dead Sea, the Jordan River, the Mazada, and Jerusalem. The trip, the fellowship with fellow Christians in the land of Jesus, and the incredible blessings from the production experience were magnificient. We look on that trip as a unforgettable highlight of our life journey. When we returned I received a package in the mail. Unknown to me, Lee and a friend, who has traveled extensively in Israel and other Mediterranean area countries, had gone shopping. Lee found these little treasures and, with the bargaining help from his friend A.C., he bought my birthday present. I was delighted! These are clay artifacts from the First Century A.D.
the other is a pitcher normally used to hold oil. At least that is what was indicated on the certificate of authentication. You can see a spot that was mended near the lip of the pitcher. The pitcher is 4 inches tall. You can see some damaaged areas near the front of the lamp. It is so tiny--just 3 1/2 inches long and 2 1/4 inches high. The lamp is packed with dirt, just as it came from the ground. The salesperson in the shop asked Lee if he wanted the dirt cleaned out. Lee declined. I am glad he did. I like having it just the way it was found. These are real treasures for me. I can just imagine them being used in a home during the time of Jesus and the disciples. They are also a reminder of the wondrous experience we had of walking where Jesus walked. Yes , I'm a little late with this post--Let's call it technical difficulties! The scanner and I continue to have issues! This is our son, Greg and his bride, Audre', on their wedding day, June 3, 1995. Greg and Audre' at his Deacon Ordination in 2006. It has been our joy to watch them grow in their love of each other and the Lord for the last fifteen years. They met at Glorieta Baptist Conference Center, in New Mexico the summer of 1992. They were serving on staff for the summer, both working in the Chuck Wagon--a snack bar/coffee shop on the Glorieta campus. Their "summer romance" became a more permanent attraction and after three years, and graduation from college for both of them, they were married in Louisiana on June 3, 1995. They now have two children, six year old L boy and three-year old E Girl, and live just a few miles from us. Greg is a high school English teacher and Basketball coach. Audre' taught school for several years, but has been a stay at home mom since E was born. She is currently serving in a part-time position on the ministerial staff of our church. Lee and I want to thank the Lord today for Greg and Audre', their Christian witness, the joy they bring us on a daily basis, and the opportunity to be their parents, as well as their brother and sister in Christ. Blessings on you in your thirteenth year of marriage. L Boy and E Girl came over Sunday to visit for awhile. Their dad was doing some little jobs for me and they tagged along to visit. After E had her turn on the computer, she and I went outside so that L could have uninterrupted computer time. He thanked me later! E is quite the helper right now! When she is with me she wants to do everything I do. Since the petunia pots outside were looking a little dry we went to water them. She had to have a water container that was her size and was very careful and business-like about getting them watered. It needs more right here! Uh Oh! The water pitcher is empty! It is little times like this that make grandparenting so sweet! AND THE ANSWER IS. . . !!!!!!!!!!!!!!! For this meme I gave nine statements about myself. One of them is false. Let's see how many people I fooled. The item with the most votes was #4 with four votes. Two people chose #3; one person each chose #5 and #8; and one hoped it wasn't #9. Here's the real scoop! 1. TRUE A third grade girl once told me that her grandmother was just half human-being. Imagine a precious little girl standing with her hand pointing to the middle of her forehead. She took her hand and drew an imaginary line through her face, over her nose, through the middle of her mouth and on down the middle of her chest. Then she motioned to the right side of her face and said,"My gran'mama is half Indian. This side is Indian and the rest is just plain human bein'!" One of my favorite stories--Kids say the darndest things! 2. TRUE A Dad sent his wife to tell me that she and I were to climb into the trash dumpster and find the retainer that their son accidentally threw away. Dad had determined that the loss was our (Mom and Me) fault that the retainer was lost!!! Uh-No! I did not get in the dumpster. I didn't lose a retainer--At least not that one. I lost a couple of my own--Until my own dad made it very clear I was not to "accidentally" throw another one away! 3. TRUE When I was an assistant principal I had principals that talked me into dressing as Dolly Parton and a large blue piece of the candy that melts in your mouth not in your hand. Of course this had to do with meeting fund raising goals. ! I love those two people to this day, but I determined when I was a principal I would NOT dress up to get money. Well, there was the time I wore pajamas to school--and, er, there was that funky chicken dance, the "jail" at the carnival, and . . . What principals will do to make a buck for the school! 5. TRUE As a principal I learned to always have chocolate, Mi*dol, ibuprofen, and an open door for teachers in need. Of course! And coffee, and occasional donuts! 6. TRUE I have held kindergarten children on my lap during story time, read book after book to others, and let some take a nap on a mat in my office to help them get through the first day without their mommies. One of the best things about working in an elementary school is watching kindergarten children come in as barely more than babies and leave at the end of the year as confident, happy learners! They are precious and I always considered it a privilege as principal to be "on call" for kindergartners--especially during those tender first weeks of school. 7. TRUE One time I heard a mother ask another one, "Does she (meaning me, the principal) think she's in charge or something." My son, who teaches English and coaches basketball at an academic magnet high school says, "If a principal hasn't heard that at least once he/she is probably not doing the job right!" 8. TRUE I once encountered a little boy coming out of the restroom, adjusting his zipper, as he sang, "It takes two hands to handle a whopper!" Some of you will remember the jingle from Bur*ger K*ing with that phrase. This was in my first year of teaching--in Texas-- and I was always surprised by what little boys would do! No more--after raising two at our house! 9. TRUE I was assistant principal at a school that had its own groundhog living under the building. This was in an old high school building being used as an "annex" to an elementary school while a new school was being built to handle the growth in the community. We had a big field behind the school. Behind that field--and down a hill--there was a small creek. There was a variety of animals that lived on the edge of the creek--we would sometimes see them, or signs of them as they came and went from their homes. There was a big daddy Groundhog, a mama, and some babies that set up housekeeping for a while in a hole they dug under the warm boiler room in the back of the building. It was not an area where children ever went, but they could see the animals from some windows on a side hallway. We used it as a learning experience until the babies were large enough for the family to be encouraged to move their home. So there you have it! A glimpse into life in an elementary school! One thing for sure--It's a place where you are never bored and can always feel needed. I know my professional career was directed by the Lord. I am thankful for having done it and enjoyed almost every minute of it! I tagged a couple of people in the first post. If you want to do this meme, consider yourself tagged. It's a fun way to tell us some of your life story. Go for it! I've been tagged by Midlife Mom at Home on the Range for a meme. This one works this way--I am to give nine statements about myself. One of them will be false. Can you pick the one that is not true? Leave your choice for the falsehood/untruth/lie in your comment. Let's see how many people I can fool? I am a retired educator, having been an elementary classroom teacher, a reading specialist, and an elementary assistant principal and principal. After more than thirty years with children, their parents, and teachers I have lots of stories to tell. Which one of these nine incidences do you think is not true. 1. A third grade girl once told me that her grandmother was just half human-being. 2. A Dad sent his wife to tell me that she and I were to climb into the trash dumpster and find the retainer that their son accidentally threw away. 3. When I was an assistant principal I had principals that talked me into dressing as Dolly Parton and a large blue piece of the candy that melts in your mouth not in your hand. 4. I rode with the principal and some other teachers in a hot air balloon to promote our new school. 5. As a principal I learned to always have chocolate, Mi*dol, ibuprofen, and an open door for teachers in need. 6. I have held kindergarten children on my lap during story time, read book after book to others, and let some take a nap on a mat in my office to help them get through the first day without their mommies. 7. One time I heard a mother ask another one, "Does she (meaning me, the principal) think she's in charge or something." 8. I once encountered a little boy coming out of the restroom, adjusting his zipper, as he sang, "It takes two hands to handle a whopper!" 9. I was assistant principal at a school that had its own groundhog living under the building. After all these years, I have a million little stories I could tell, but I will stop at nine as called for in the meme. OK which one is NOT true? Make your guess in your comment. I will reveal the correct answer in a day or two. Now, for the tagging ceremony! I usually just let people choose to participate or not. This time I think I will actually try tagging a couple of ladies. I tag Becky, The Butler's Wife, and Betty, at Country Charm. Ladies, I will understand if you choose to pass on the meme--your choice. Anyone else that has eight facts and a lie they would like to tell us--consider yourself tagged. It's time for Show and Tell! This week for Show and Tell I want to share with you some family treasures that hang on the walls in my home. These are embroidered pictures which were done for me by my stepmother, Rachel. 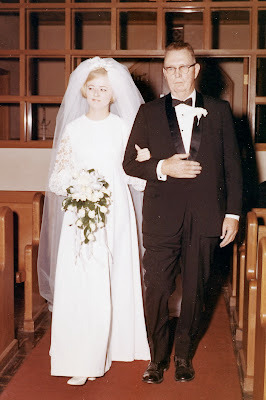 Rachel married my Dad, Charlie, in 1961, when I was fifteen. My Dad passed away in 1989. Rachel and her daughter, Carol, are still very much a part of my family. Rachel will be 92 in July. She lives in Texas and still has her own home, but stays with Carol for several months of the year. She is always ready for a family get together. I look forward to the next time we are together. Rachel has quite a talent for needlework. She has made many pictures similar to these for her nieces, as well as my sister and stepsister. Her brother-in-law, Leroy, has done almost all of the framing for the pictures. Although some of the frames were purchased, he made many of them in the workshop behind his home. Rachel signs and dates all of the work on the back so that we have a permanent record for posterity. All of us who have her pieces of her work appreciate the time and effort she put into the pictures and are honored to display them in our homes. currently hangs in my guest bathroom. There are two notes on the back. The first one says," I completed this picture in Nov '92. Leroy put it in the frame Sunday afternoon, 11-15-92.
currently hangs in the small hallway outside our guest bedrooms. "Myrna, I hope you will enjoy these pictures, The Four Seasons. My love for you is not seasonal. You are a dear! Frames made and pictures framed by Leroy B.
near the doll shelf that I shared in an earlier Show and Tell. I hope you have enjoyed Show and Tell at Cherish. . . the word! Let's go to Kelli's and see what other people have to share.